I’ve never really been a bronzer girl, always leaning towards blush. Mainly because bronzer always had this reputation as looking really un-natural, muddy or just badly done. I was too wary to try it and get it wrong… But over the last year or so – I blame the contouring trend – I’ve given it a go more often and now well and truly on the bronzer bandwagon. It’s replaced blusher as one of the products I have no matter how minimal my make-up is. It warms the face and give that bit more definition. 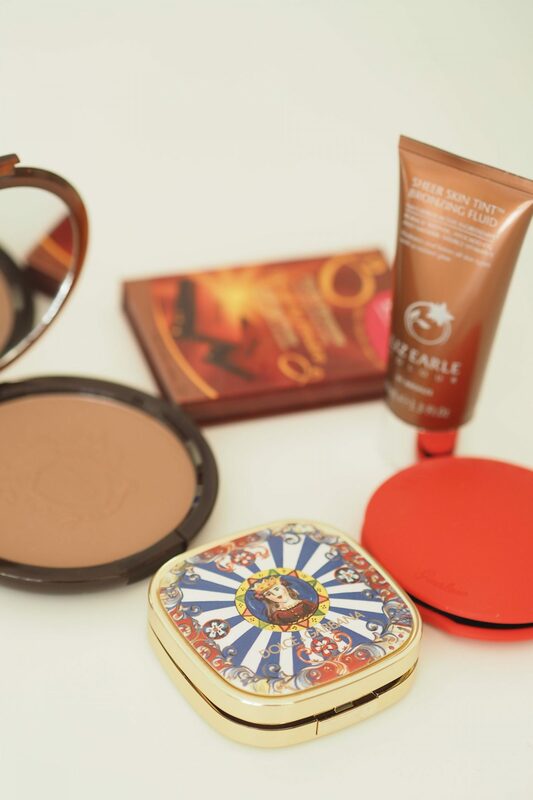 I’ve actually been really loyal to my Chantecaille HD Perfecting Bronzer that I’ve been using as an every day staple for a few months now, but wanted to pull together a few beautiful bronzers – old and new – that are worth a look as it’s all very well showing my favourite. Covering various textures, and matte and shimmer options. So hopefully something here for everyone – of all budgets and tastes. I love this product because whilst the packaging on the outside makes it almost too pretty to use, the inside is plain enough that I feel no guilt. 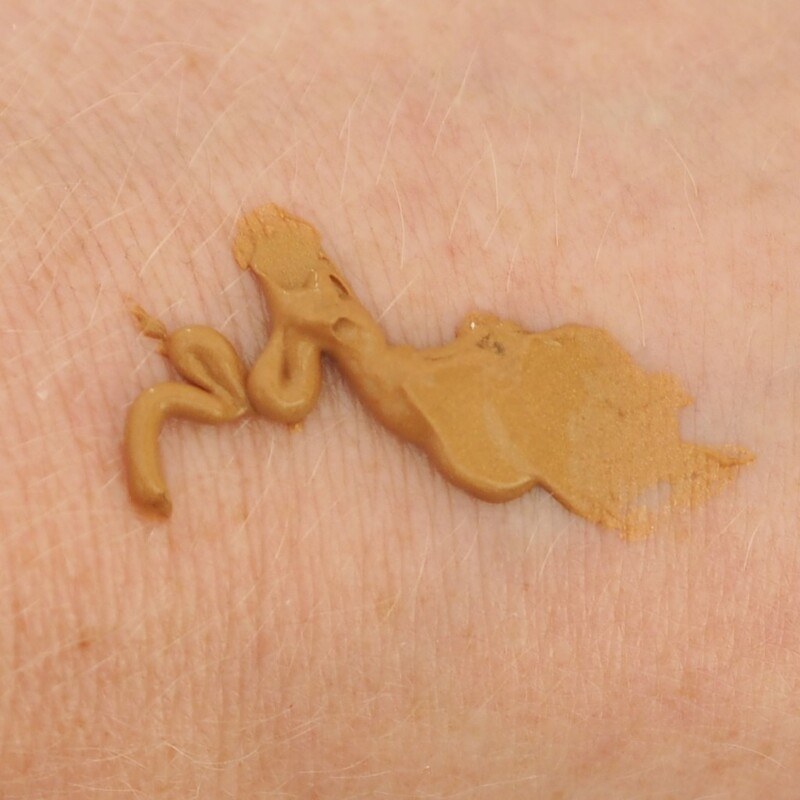 For me, I love this shade as it’s neutral toned enough to suit me without going down the muddy face route. Plus it’s matte, so no fear of sparkle face. It just adds that warmth, without looking overdone. Plus, did I mention how pretty it is?! Best for: A crowd pleaser – pretty and flattering all round. A massive bronzer in a medium shade that’s perfect if you don’t want to restrict your bronzing to your face. This is perfect for with a big old bronzing brush taking it all over so you can give your shoulders/chest and beyond a hint of bronze, without needing to faff around with fake tan. It’s available in Golden Light and Medium – I’d be best suited to Golden Light, but the Medium is good if you have a bit of a tan or are just darker skin tone anyway. Best for: All over brozning – for face and body. Guerlain has more bronzer offerings than I have pairs of trainers (and trust me that’s A LOT) so this is the brand to turn to if you want to find the perfect one for you. There’s everything from the beautiful ‘Four Seasons’ ones that offer a bronzer/highlight hybrid of four shades that blend to give a gorgeous glow – or use singly to customise to your tone at that time. To bronzers in matte and shimmer textures designed to match every skin tone you can imagine. This is the ‘Natural Blondes 02’ one that has the Limited Edition red silicon sleeve (not just a pretty addition, also protects your bronzer so less likely to get broken). Within the Terracotta range there are five shades ranging from 00 Clair Blondes to 04 Moyen Blondes. Basically there’s a range of tones, shades and texture options to suit everyone. My personal favourite from the Guerlain Terracotta family has to be either the Sheer Bronzing Powder (a mosaic of bronze and lighter pink shades) and the Four Seasons. This particular bronzer shown here is ideal if you have a darker/olive skin tone as the warmer terracotta (see what they did there) shade is ideal. 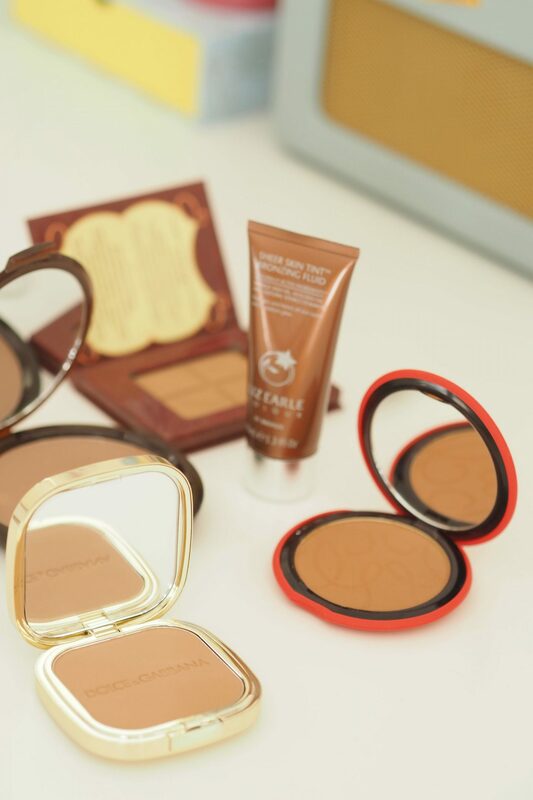 Best for: Finding your perfect bronze as there’s one in the range for everyone. A cream/liquid option for those who prefer to add their bronze in a less powdery way. I am partial to a more liquid bronzer when on holiday or when it’s really hot outside. Often opting for a liquid bronzer and skipping the foundation all together to keep it minimal – who wants to wear the heaviest of make-up on hot days? The thing I like about this Liz Earle sheer tint is that it’s cooler toned and quite golden – so it adds some warmth, but also works as a bronzing highlight option too. As you can see in the direct sunlight shot, it has that find shimmer that when blended out will give that glow. I wouldn’t say that this would work as a bronzer if you have darker skin, although as a highlight it could look really pretty. But as someone with paler skin, the golden tone works for me – especially as it’s sheet it still lets my freckles show through so doesn’t cover what you already have just adds that little something extra. However, if you like your bronzer powder based Liz Earle also have one called Radiant Glow Bronzer that I haven’t tried but have heard is rather beautiful. Best for: Paler skin tones or those who prefer to use liquid bronze. An absolute classic, would you believe this is 10 years old?! This little square of bronzing goodness that could easily be mistaken for a block of chocolate from a distance has to be one of the best bargain bronzers out there. Bourjois as a whole is a great high street brand to turn to for a bronzer. Previously it’s been sort of assumed that high street/cheaper brands are more likely to be on the orange side, or maybe too shimmer heavy. But this is neither, it has a hint of shimmer but doesn’t pay off as glitter (phew) and it’s nice and neutral toned so doesn’t go too orange either. Again, this shade is the darker of the options out there (there’s also a ‘Claires/Medianes’ option). But for a high street bronzer – at £7.99 – it’s a classic product that’s great value. They also have shimmer/golden variants of the powder too, if you like to go for a bronze with a glow too. There are a few other gem bronzers from Bourjois too – for matte they have the Mat Illusion Bronzing Powder (in two shades) or the Maxi Delght bronzer that’s loaded with shimmer and great for all over the body or of course the BB Brozning Liquid. Basically, it’s the go-to brand for bronzing options on the high street. Best for: Bargain bronzing, if you like to get a glow with change left over. 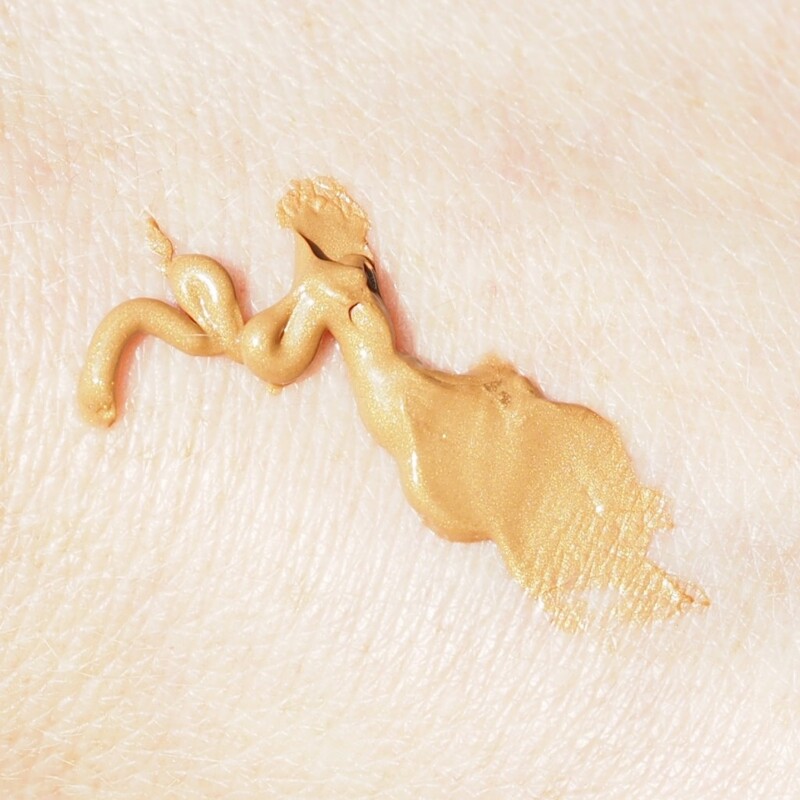 Do you have a go-to product for bronzer or like to switch it up depending on what look you’re after at the time? 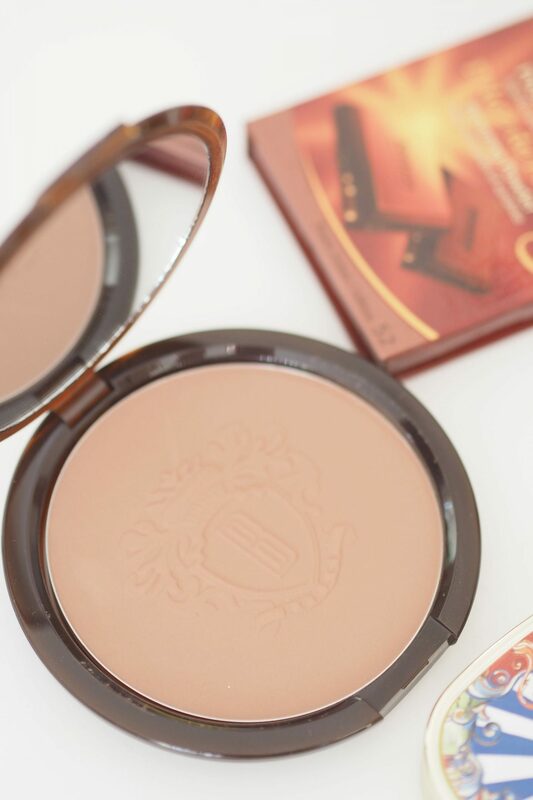 That Bourjois bronzer is still a really firm favourite in my collection and I think it always will be! Lovely picks! The Bobbi Brown Face and Body Bronzer sounds lovely and actually very practical for matching the face to the body! The Liz Earle Sheer Skin Tint looks gorgeous as well! Bourjois bronzer is my favorite. Probably is so good because is Chanel. I love their product because is high-end. Great post about bronzer. I also like the fact that you choose mat bronzer. Bronzers are my makeup weakness, I can’t help but buy more whenever I see another one I think I’ll love! 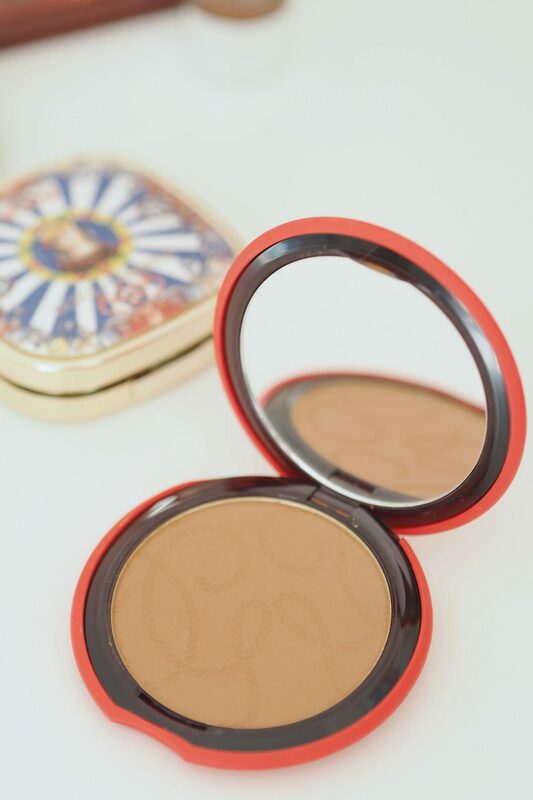 Guerlain’s bronzers have to be my favourite, so I’m automatically drawn to that beautiful, coral compact! Not such a fan of the Bourjois bronzer, though – I find it can look quite orange and doesn’t always blend well.